The Freedom From Religion Foundation has put up an exhibit honoring the Bill of Rights at an Illinois courthouse. 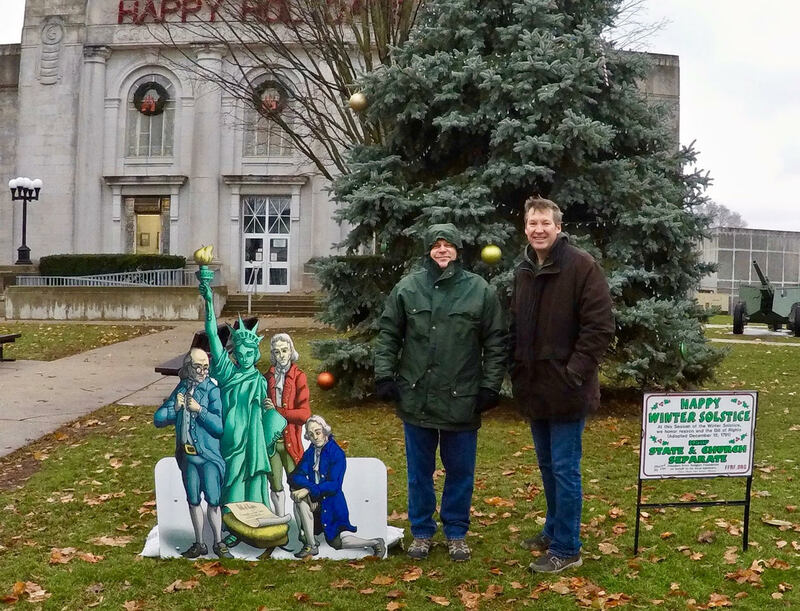 The display was installed by FFRF Member Will Meyer at the Grundy County Courthouse, not too far from Chicago, on Nov. 23 and will be available for public viewing till the end of December. The mainstay of the tableau is FFRF’s playful Bill of Rights “nativity.” The irreverent cutout by artist Jacob Fortin depicts Founding Fathers Benjamin Franklin, Thomas Jefferson and George Washington gazing adoringly at a “baby” Bill of Rights in a manger while the Statue of Liberty looks on. The display exemplifies the take-charge spirit of members of the freethought organization, who often assemble such installations in their home towns to counter religious tableaus on public land. FFRF helps out by providing the materials. With the help of its ever-vigilant membership, the Freedom From Religion Foundation is keeping the flag of freethought flying high around the country. The Freedom From Religion Foundation is the largest national association of freethinkers (atheists and agnostics) with roughly 32,000 members and several chapters all over the country, including almost 1,000 members and a Chicago chapter in the state of Illinois. The organization works to protect the constitutional separation between religion and government.